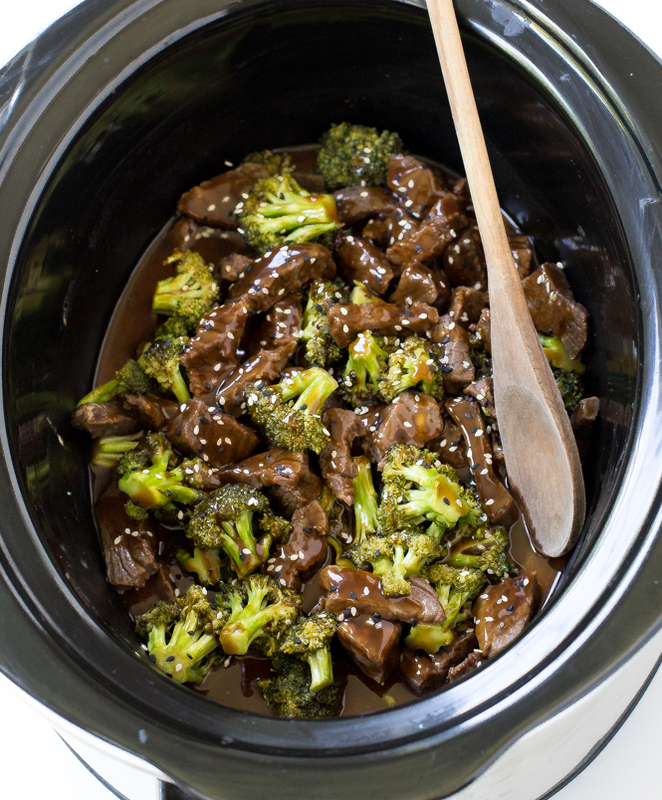 Slow Cooker Broccoli Beef. Super tender steak cooked low and slow for 5 hours! Serve over a bowl of rice or noodles! 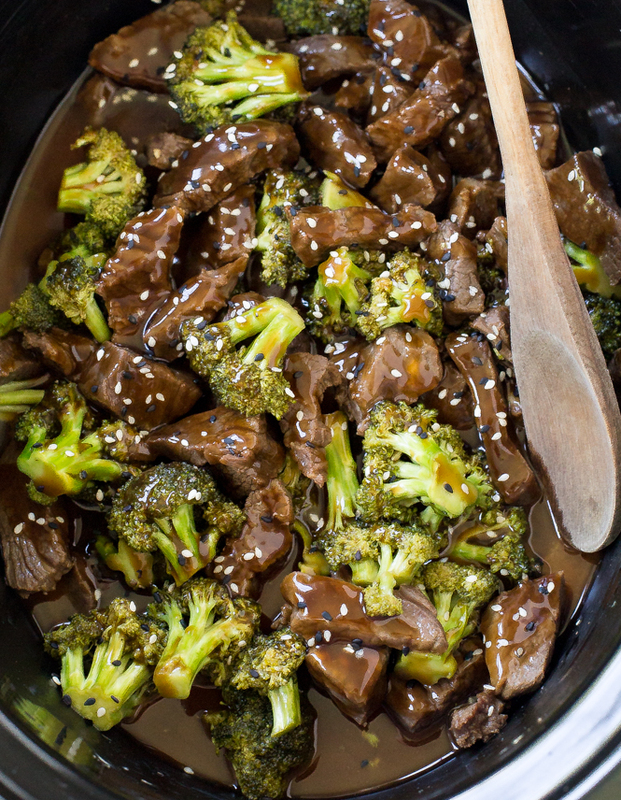 I love making takeout dishes at home and this Slow Cooker Broccoli Beef has to be one of my favorites. Now you can make your favorite take out dish at home AND in a slow cooker! This Beef and Broccoli is awesome! Super tender chuck roast simmered for 5 hours in a flavorful sauce. The sauce is made up of beef broth, soy sauce, garlic, oyster sauce, brown sugar and sesame oil. Cornstarch is added at the end to thicken up the sauce. The broccoli goes into the slow cooker just before it’s done cooking to make sure the broccoli isn’t overcooked. You can use flank steak or chuck roast in this dish. I recommend using low sodium beef broth and soy sauce to better control the salt level in this dish. This dish is super easy to make and requires only 10 minutes of prep time. Serve over fried rice of noodles! 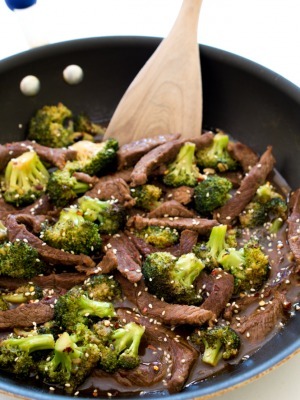 My Easy 20 minute Broccoli Beef is also a hit if you are short on time! 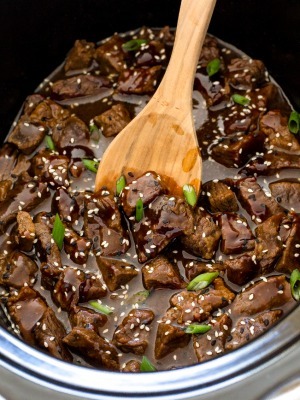 Add steak, broth, soy sauce, garlic, oyster sauce, brown sugar and sesame oil to a slow cooker. Stir to combine. Cook on low for 4-5 hours or until steak is tender. Reserve 1/4 cup of the cooking liquid and whisk in the cornstarch to the reserved liquid. Slowly stir the cornstarch mixture into the slow cooker along with the broccoli and continue cooking on low for an additional 30 minutes or until sauce has thickened and broccoli is tender. Serve immediately with rice and enjoy! 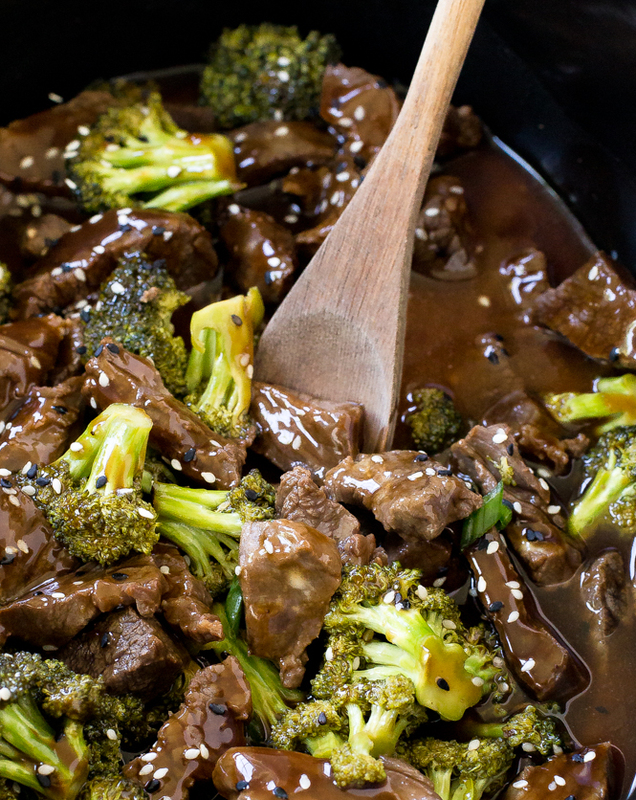 Only you could make beef and broccoli look SO gorgeous, Kelley! I seriously want to dive into that crockpot! This is most definitely going on the dinner menu for next week! What a waste of over cooked steak! How many recipes for Beef and Broccoli does one need? I am so sorry to hear that this did not turn out for you! How long did you cook it for? Her comment didn’t make any sense to me. That leads me to believe your recipe wasn’t the problem, Miss Kelly. I made a recipe similar to this except it added a small diced onion. It also called for a high quality cut of beef (I used filet). I cooked it for 2 1/2 hours on high. It was fabulous. Would have also been good with mushrooms added. I served over plain jasmine rice. No need for fried rice. The two flavors would compete, I think. I agree… Acatlady, no need for fried rice… did jasmine as well. This is amazing! I made it tonight and the meat was so tender… and the flavor…wow! I am so happy to hear you liked it Mandy!! Thank you! I hope you enjoy Becky! I don’t like oyster sauce. What can I use in it’s place? You can use hoisin sauce in place of the oyster sauce. Can i get away with omiting the oyster sauce and sesame oil? Would it taste weird? I am ok if it doesn’t have the exact flavor as the restaurant. Yes you could omit those two if you don’t care for them. I think it will still have good flavor! Can you use beef stew ? Beef stew meat would work but would take a lot longer. I would say 6-8 hours on low. Yes you can use beef stew meat. It will take longer in the slow cooker (about 6-8 hours on low). I made this recipe with tenderloin beef and it was incredible! I didn’t add the oyster sauce (because I didn’t have any) and cooked it on high for three hours. Everything else was as the recipe directed. Absolutely delicious!! This is a keeper! I have made this recipe before with fresh broccoli and according to the directions. It was delicious! I am trying it today with frozen broccoli and added it in the beginning accidently. Should I try to scoop it out? I would not worry about scooping it out since you already added it. I think it should be fine. Let me know how you make out! I made this for dinner. As always, when using a Crock-Pot, it’s great smelling it cook throughout the day. Delicious! I did leave out the oyster oil and did not miss it. I served with a fried rice recipe I also found on Pinterest. So glad you enjoyed this!! Thanks for sharing! I don’t have any oyster sauce.. will this recipe work without it? Or is something else I Could put in as a substitute?? Yes you can omit the oyster sauce. Hoisin sauce is a good substitute. I am so glad you enjoyed this!! Yes I would omit the sugar. You could also use coconut aminos instead of low sodium soy sauce for a lower calorie option as well. So i have this cooking as i write and just realized i have no rice 😥🤔. So im making homemade mashed potatoes. Hoping thats a good choice with it. That will go perfectly to soak up the extra sauce!! This came out delicious. I substituted the oyster sauce with hoisin sauce. Cooked for 4.5 hrs, and dished with jasmine rice and the broccoli. Received very positive comments. Thanks! So glad you enjoyed this! Thank you so much for sharing! If I got frozen broccoli florets, can I just put it into the mix frozen or do I need to defrost? I would just put them in frozen. We enjoyed this but found it a bit too salty (we use very little salt in cooking) I used low sodium soy sauce. Any ideas? I am so sorry to hear this. You can try substituting some water next time in place of the soy sauce or just add a little less soy sauce. Hope this works better for you next time. I’ve got this recipe in the crock pot now. I didn’t see any specification for what temp to turn the crock pot on if planning to cook for 4-5 hours. This may be a silly question but… Low or High? The directions say to cook on low for 4-5 hours. It does say chuck roast, but also chuck steak. Can you use either? Yes either can be used. Cooked exactly like your recipe is warranted. DELISH!!!!!!! Super easy to make! 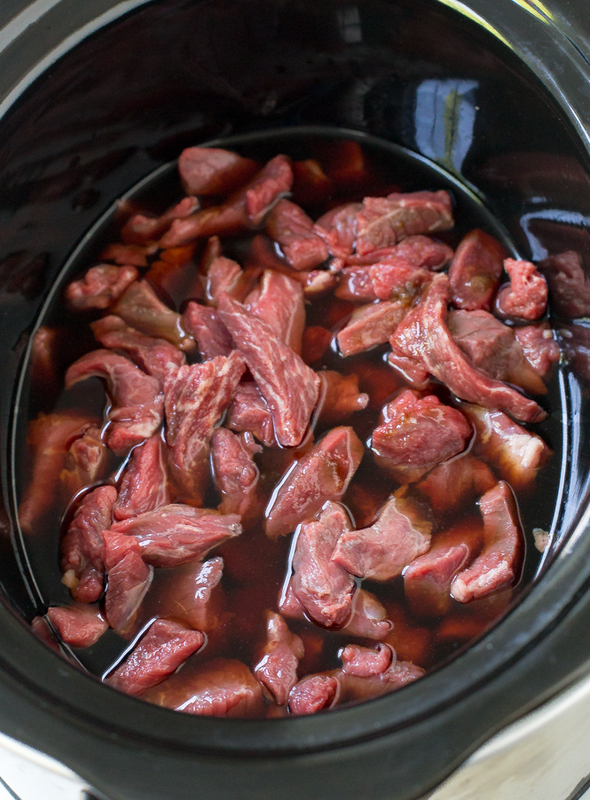 It took 4 hours for our crockpot to tender the beef stew cut steak and juices. Added the fresh broccoli for 30 mins. Perfect! I used white rice for bedding. Thank you!! Will definitely be cooking again! So happy to hear you enjoyed this! Thank you! Would a tri-tip roast work for this? Yes a tri-tip roast would work well for this!